In Pics: 382 women come together at Mumbai's largest Karwachauth bash! 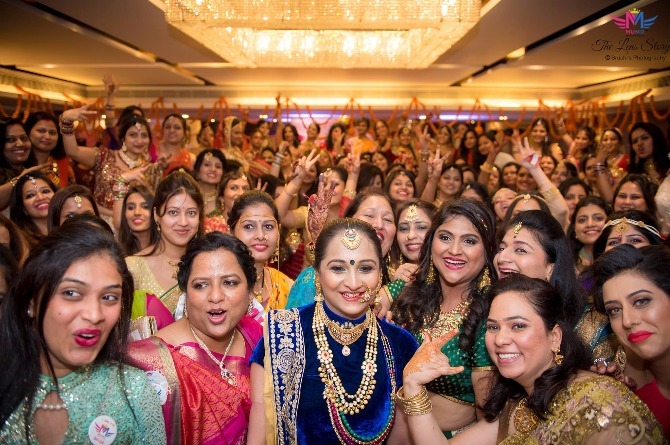 Mumbai's largest Karwachauth bash was held at Khar Gymkhana on October 7 and you'd be shocked to know that it was attended not by 50, not 100, but by 382 women from all across Mumbai. What was surprising was that these women belonged to different religions and even though Karwachauth was not a custom observed in their families they came forward as the members of one Facebook community, MUMO Mumbai moms, to celebrate the spirit of this popular festival and to get some much-needed time off from their taxing routines. Entering its fourth year, Shagun 4.0 was a lavish affair with all of these women decked up in their bridal finery. Some of them wore their wedding outfit once again for the event and got all nostalgic as they were reminded of their wedding day. Click start slideshow to browse through some of the pictures from the extravaganza organised by Neha Kare and her team of MUMO Mumbai moms. 7 Bollywood couples who have amazing zodiac compatibility!